Although my mom did most of the cooking during my childhood, I learned more about cooking from my dad. My dad cooked fun stuff, while my mom made the daily staples. My first memory of my dad’s “fun” cooking comes from a dish he made for us using leftovers. One of my favorites is what he calls an “Italian omelet”. I don’t think there is a traditional dish called Italian omelet. 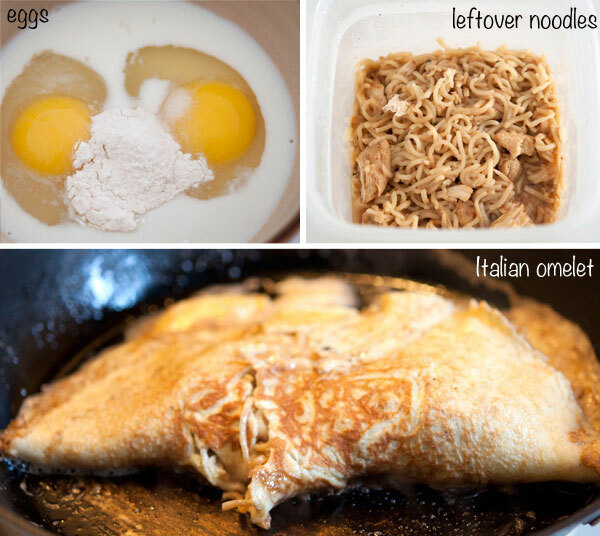 My dad’s signature Italian omelet is a regular omelet stuffed with leftover noodles, spaghetti, or lo mein, with a dash of ingenuity. While simple eggs can be used, my dad adds little bit of flour and milk to give eggs crepe-omelet hybrid like texture. Beat eggs, milk, flour, and salt together. Cook the beaten egg mixture in a greased pan like any other omelet over medium heat. When eggs are half way done, add noodle. Lower heat and fold eggs to cover noodles. Cover the pan and cook for a minute or so. Through his omelet, he taught me the delicate balance between overcooking and undercooking, creatively using leftovers, joy of kitchen experiments, and tricks for using kitchen gadgets if you lack skills. Overall, he made cooking fun for us kids and inspired us to experiment and develop our own cooking styles.